When the Weeks family brought little Lavender, a four-month-old Syrian hamster, into our out-of-hours service, it was obvious she had caused herself some damage. The family had been left baffled when Lavender was not in her cage and had apparently gone missing from their Wickford home. However, after a hunt for the newest member of the family – which included leaving treats out to entice the friendly rodent out of hiding – the Weeks were alerted to a squeaking noise coming from behind the kitchen oven late at night and discovered Lavender was trapped. The family immediately contacted our out-of-hours service and vet surgeon Amy Andrews assessed Lavender, before carrying out an extremely rare operation to amputate her severely damaged hind leg – in the process saving her life. Lavender, who has recovered remarkably well, is now getting used to life with three legs but the accident doesn’t seem to have diminished her appetite for exploring. Owner Michelle Weeks said: “We noticed she was missing first thing in the morning and had searched all over the place, leaving treats out, but it was about 10pm when we heard a noise from behind the oven and found her trapped. “My son had to lift the oven for me to get behind and get her out. It was obvious she was hurt as her leg was facing the other way but you wouldn’t know it from her demeanour as she didn’t make a sound. “We took her to Cherrydown’s out of hours service and they explained the risks of the operation but it was an easy decision for us. Lavender is only a few months old and my daughter Lily adores her so we said to go ahead. Vet Amy said due to the unusual nature of the operation the theatre was full of vets and nurses. 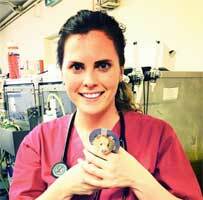 She said: “Receiving an emergency out-of-hours call for a hamster is quite a rarity. 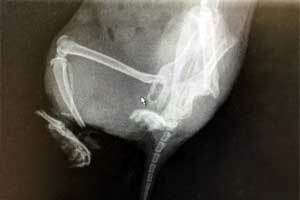 When Lavender arrived, it was clear her injury was very serious. “Lavender’s owners had to make the choice of either taking the high risk of a general anaesthetic to amputate her fractured leg or make the sad decision to put her out of her pain. To aid Lavender’s recovery our vet nurse Bridie Currie made her a specially-designed tiny lavender-coloured buster collar.